This year’s challenge got off to a good start with the typical Lakes’ rain, which stayed with us for 3 days out of 4 with the added benefit of extreme weather conditions such as poor visibility, 40mph head winds and floods!!!! At times I could describe it more like swimming rather than cycling with rain water up to the pedals. 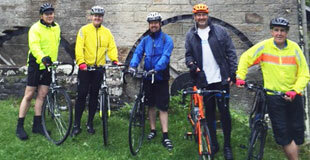 However, the team kept together, supporting each other with great humour, cycling 170miles and climbing up to 3,800ft. We were able to burn up to 2,800cal in a day which were promptly replenished in traditional pubs along the way! This year was MUCH harder than last year but not comparable to the suffering those afflicted with Alzheimer’s and their nearest and dearests go through with this terrible disease.